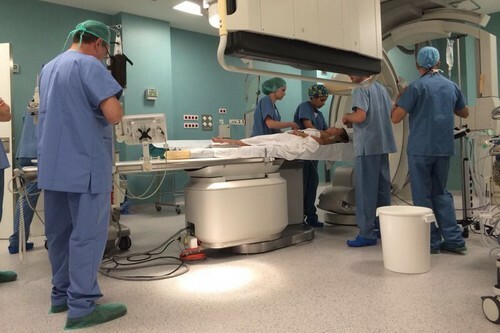 In January 2019 a team of professionals comprised of cardiologists, neonatologists, anesthesiologists and nurses performed a cardiac ablation in the Hematology Room Daniel Bravo Andreu for a girl of only 1,310 grams of weight, pointing to a new milestone in cardiology catheterization. With this intervention, the Arrhythmias Unit of the Sant Joan de Déu Hospital in Barcelona managed to cure a girl with incessant tachycardia (300 heartbeats per minute instead of usual 150) This Unit is the only reference centre in Spain designated by the Ministry of Health for the treatment of pediatric arrhythmias. Thanks to the Private Foundation Daniel Bravo Andreu, the hospital has one of the most technologically advanced intervention rooms allowing cardiac catheterization in preterm infants and even in foetuses suffering from congenital heart disease. In these facilities, around 550 electrophysiological procedures such as cardiac ablations, pacemaker placement, defibrillators, installers, etc. are carried out each year. A third of the patients receiving them are less than one year old and the rate of effectiveness is 96%. The new Daniel Bravo Andreu Catheterization Laboratory at Barcelona’s Hospital Sant Joan de Déu opened September 2014. This high-technology facility is exclusively for paediatric use and is the only one of its kind in Spain and only the fourth in Europe. The new haemodynamics room has been equipped thanks to the Daniel Bravo Andreu Private Foundation and is now a key element in the hospital’s Heart Unit. By donating this high-technology equipment, the Foundation aims to help give professionals access to the best tools to treat patients. It is a three-dimensional flat-panel biplane system that cuts the radiation patients receive by up to 70%. As it is used with paediatric patients, children, this reduction is very important to minimise their current and cumulative exposure. Additionally, thanks to its CAT function with ground-breaking systems to acquire and process data, the machine gets highly accurate and precise two- and three-dimensional images that can be superimposed and used as a real-time guide during surgery. The new 100-square-metre room provides ample space to develop new procedures and add further equipment in the future. It has many different applications, in fields such as interventional cardiology and diagnostics, and to treat complex paediatric arrhythmias, peripheral vascular processes and neurointerventions, as well as some oncological pathologies like retinoblastoma.